Great homes start in Sunshine Coast. 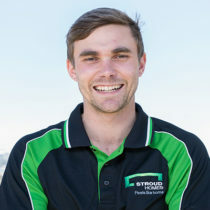 Meet Stroud Homes Sunshine Coast Builder Dan Chapman. Communication is important for Dan who makes sure his clients are clear on what they are getting. By forming professional and friendly relationships with his customers, Dan can help provide a fantastic building experience which culminates in handing over a quality home. Stroud Homes Sunshine Coast brings you beautiful, award-winning homes that fit your land, your budget and your family. From the very beginning when we stepped into the Stroud display house in Bli Bli, we felt as though building with Stroud Homes was going to be the right choice. Being first time builders, we had plenty of questions and concerns which the whole team at Stroud were more than happy to answer to help put our minds at ease. We were impressed with the wide range of standard inclusions, including an amazing gas stove, stone benchtops throughout the house and the option to customize our plan. The workmanship and quality of our build is beyond what we expected, and honestly, we could not be happier with the final product. Throughout the whole build, we were kept in the loop with how much work was planned for the week and how much was achieved so we always knew what stage of the build we were at. Barry, our site supervisor even sent photos of each build milestone so we had the opportunity to see how everything was coming together. The whole build was completed within 10 weeks, thanks to all of the hard work and exceptional management from the Stroud homes team. Every member of the team went above and beyond to make sure the final product was exactly what we wanted. Stroud even included a final walkthrough with handovers.com to ensure nothing was missed to make our first home perfect. For an efficient, high-quality build, build with Stroud homes! We were lucky enough to pick Stroud Homes for our very first build. It took us a while to pick a builder as it is such a daunting process, especially for us first timers. Tyrone Fourie was so very patient with us, never pushed us and worked with us every step of the way to make sure we were completely comfortable and happy with the plans (even after the 50th amendment). The next thing we knew the slab was down. Then it seemed like we just blinked and our beautiful house was built. Scott has been an absolute dream and was polite, respectful, genuine and actually just cared about our house and the quality of the build. Nothing was an issue and anything we raised (which was only ever very minor) was fixed in a heartbeat, no ifs, buts or issues. The quality of the work is wonderful. The house just feels solid and our new tenants even said that after looking at 15 other newly built houses in the area, ours, the finishes, the quality and the look just stands out above the cookie cutter rest. The build was the easiest part of the entire process. We were kept up to date and we had such confidence in the Stroud team. We cannot thank them enough and we will absolutely build with them again, hopefully, in the not too distance future. Absolutely faultless service from start to finish. Couldn’t have asked for more from my site supervisor, Shane. He was outstanding and always on hand to answer any of my questions. The quality of the build is fantastic and I’ve already received comments since handover on how good the finishes are. As a widowed mum of one, the prospect of building on my own was daunting to begin with but I’m so glad I chose Stroud Homes. I have no complaints and would have no hesitation in recommending them to anyone looking for a quality builder with great communication. 10 out of 10 guys. Thank you!! From the very first meeting and right through until the handover of our new house, the team from Stroud made our first building experience a very easy and memorable one. Dan & Sarah have delivered on everything that was promised and we are very happy with the quality of the home we received and how smooth the build went. Shane our building supervisor was extremely professional and we felt very comfortable that he was looking after the build. Everyday we would get a message from Shane via a great app called Voxer and he would let us know what had been done and send through photos for us to see which was greet as we live interstate. I highly recommend the Stroud team and can’t thank them all enough for the beautiful home they built us. We purchased a block of land in Yandina in January 2017. It was always going to be a difficult block of land to build on given its slope and the fact we had strict covenants imposed on the type of house that could be built on the land. From the start Stroud Homes were more than accommodating to our needs. We approached many other builders but they didn’t appear up to the challenge for the budget that we had. Tyrone was very approachable and exceptionally helpful in our introductory and follow-up meetings about the style of house we wanted on the block, whilst ensuring we kept within our budget. He knew the vision we wanted for the block and was very keen to make our dreams come true from the start. Once we approved the initial quote we were handed over to Sarah for the contracts administration side. What can we say about Sarah – the lady is amazing – she dealt with the developer in ensuring the covenants were met – he wasn’t an easy man to deal with. She also communicated directly with our bank manager and always returned answers to our questions in a timely manner. Given that we have a busy day to day schedule with our work commitments – Sarah always ensured we were kept up to date and always had our best interests at heart. We had an enjoyable experience with Debra during colour selection. She was very helpful to assist with difficult selections given the amount of options you get with the standard inclusions. She also knew our vision for our home and knew the theme we wanted to run through this style of house. The Stroud standard inclusions range is very impressive. Dan is the man. We met Dan at our first meeting with Tyrone and let just say we were impressed from the start. My partner has been in the building trade for over 20 years and could tell immediately when walking through the display home at Bli Bli that the quality of work was exceptional. We were also impressed that Dan was so down to earth and approachable. He was excited by our choice of home and was more than happy to ensure that we were going to get value for money. Even when we had hurdles with council – he was there on the day to discuss any changes that needed to happen to ensure our home would be built. Just a true gentleman to deal with. We haven’t had the pleasure of meeting Barry our site supervisor yet. The block only has been recently cut however I was impressed that Barry sent us photos of the work the day the block was being cut. Looking forward to dealing with Barry going forward and the progress of our home with Stroud. Let the building begin – can’t wait to see the final result!!! When my husband and I decided to build our 1st home we found the building process incredibly overwhelming, so many builders who offer so many different inclusions, until we found Stroud Homes (Sunshine Coast). Right from the beginning Dan & the Team worked with us to get our design perfect within our budget without missing out on a few of our luxuries. Once the building processes started we were kept upto date with weekly reports, (How we miss Friday update). The team work hard & quickly, Shane (the site supervisor) is very approachable, articulate and very organised being able to plan work around different conditions e.g weather etc. The building site was always kept remarkably clean even with a bunch of tradies coming and going. If any issue arose Shane immediately contacted us and we were able to quickly find a solution or an improvement. The office staff are amazing, so easy to just pick up the phone and ask any question. Sarah in particular is always very friendly and willing to help no matter how big or small the topic might be. Throughout the build Shane shared his ideas of functionality understanding what we wanted to achieve in our home, always happy to talk to us and made us feel like his only customers. Our home looks amazing and we love it!!!! We would definitely build with Stroud Homes again, but for now we will enjoy our new home. Thank you Stroud Homes another happy customer. Couldn’t be more pleased with the results from Daniel Chapman, Shane and all the staff and contractors of Stroud Homes Sunshine Coast! Your home is your single largest investment and as all newcomers to the market I had my work cut out to ensure I was making the right decision! After all the horror stories friends and family have gone through, I knew it started with a quality builder. I met the Director, Daniel, when I was looking at land and designs. As a young professional myself, I instantly recognised his absolute passion for perfection. He is built and bred to build, coming from a family ingrained in the industry, it didn’t take him long to branch off and setup his dream building company. He is dedicated to the flawless operational efficiency of his organisation, going out of his way to ensure his builds will not just tick the boxes on looks, but will stand the test of time. Call him up for a chat and tap into his wisdom, even if you just want to query the area or are just contemplating designs, he is a genuine bloke who will do the right thing. What Stroud achieved with my build was nothing short of astounding. From my moment of unconditional approval from the bank, there was zero time wasted. The moment the funds cleared in their account, the slab was down the next day! They instantly invited me into their communication platform, which I will not disclose here as the competitors loom this platform. Suffice to say, during the build process I would received updates daily, with photo’s and comments from the Site Manager Shane. I was so amazed by the detail Shane would go through on his posts, and it really allowed me to be part of the build every step of the way! The trades that report to Shane are a bunch of highly skilled, highly motivated, masters of their craft. They do not use “cheap labour”, they use contractors that work neatly, diligently and efficiently. I am still unsure how it is remotely possible, but they managed to build my 16 week project in 14.5 weeks. THIS INCLUDED FOUR 4 day work weeks AND a cyclone. The most amazing thing to me was when the independent inspection was performed, they provided a report with ZERO defects. This is a feat that gets RARELY performed by builders, this will be the THIRD that Stroud Sunny Coast has achieved. Once my home was completed, it was rented out three days later. For an above market price. I want to give a big thank you to everyone at Stroud, you have turned what can become a nightmare for some into a dream start for me! I highly recommend anyone who is looking into builders to give them a call, and if it is at all possible in my future to obtain another place, I certainly know who I will call first. As we only wanted to build down in Parklakes2 at Bli Bli we were so lucky that Daniel and his team had a beautiful display home in the village to view. Their honest upfront approach was refreshing and their team of tradesman, office staff and supervisors were very professional throughout. Having Stroud build our house along with our choice of estates we could not be happier. A perfect marriage as they say. Thankyou Daniel and team for a 10/10 job. Stroud (Sunshine Coast) – fantastic experience, we love our new home. The Stroud team were professional, personable and worked to very high standards. The whole building experience was very smooth, nothing was ever an issue, just dealt with. Flexibility from the start, updates via the Voxer app, great for weekly updates, regular pictures and quick questions. House hand over was brilliant, we are confident in the support Stroud provide post build. As first home buyers we searched long and hard for a good builder with quality and value being of greatest priority. Stroud Sunshine Coast was a stand out from the start with their ‘turn key’ package including more than most builders however more importantly, including much nicer finishes and luxuries that are ‘extras’ with other builders. The build experience was pleasant, with any minor omissions resolved immediately without hassle. Stroud was generous with variations and on more than one occasion during the build added extra items at no cost that would have otherwise been costly. We feel we have built a quality home with nice finishings for a reasonable price and great overall value. We were delighted with Stroud Sunshine Coast from the moment we contacted them. The team were excited to adapt and design exactly what we wanted. Todd spent an afternoon (and many, MANY emails/phone calls) with us working through possibilities and suggesting ideas that became amazing additions to our home. Daniel and Sarah made the building process a pleasure. Being our first build we were nervous, especially starting from interstate, Daniel and Sarah made sure that we were in the loop every step of the way. As with all new builds there were a couple of hiccups, nothing major, but the way that Daniel handled these issues was always impeccable. Problems are not problems to Daniel, we never felt concerned at any stage about the progress or quality of the build, we had full confidence in Stroud Sunshine Coast and that is a credit to the way Daniel and Sarah do business and the way they treat their clients. Our project/build manager Barry was also amazing. Barry was excited and passionate about our build and it made the process feel really special – even though he builds houses every day – it still felt like our build was the only one on his plate (even though there were probably several). We can’t give enough praise to Barry. If we build again we will definitely request Barry as our guy. I can honestly say that I would have no hesitation whatsoever recommending Stroud Sunshine Coast to anyone considering building, especially if you’ve not built before. We recently received the keys to our new home built by Stroud Homes Sunshine Coast and we are extreamely happy with the finished product. From the first time we sat down with the Stroud team to the day of handover we have been very impressed with the level of professionalism and attention to detail the whole team has demonstrated. Being our first build we had alot of questions and definitely needed a bit of hand holding! We really appreciated how Daniel , Sarah, Shane and the rest of the team were always very responsive and supported us every step of the way. The build went smoothly and very quickly and we were consulted regularly along the way and kept up to date with its progress. The final product is very polished, we are extreamly happy with the finishes and really can’t fault the workmanship of any part of the build. We are so glad we decided to go with Stroud and wouldn’t hesitate recommending Daniel and his team on the Sunshine Coast to anyone looking to built their home. Right from the start Dan from Stroud Sunshine Coast was more than happy and excited to help us find the house that had the features we were after and in our budget. The great customer service continued from Dan and his team. Sarah in the office is lovely and happy to help and answer any questions you may have. Building Supervisor Shane was very organised, has great communication and attention to detail. They also have a great team of tradies that all do quality work. We would definitely build with Stroud Sunshine Coast again. Stroud Homes (Sunshine Coast) The staff in the office were just lovely and great. We had a great experience with them and loved their extensive choice of inclusions not available in other building companies. We have had understandable complications which have been addressed by Dan and resolved impeccably. I believe this company really cares and is willing to satisfy their clients. We feel Dan really cares about his clients and wants the absolute best result. We are looking forward to the final product. Thanks to all of the Stroud Sunshine Coast team for building our new home. 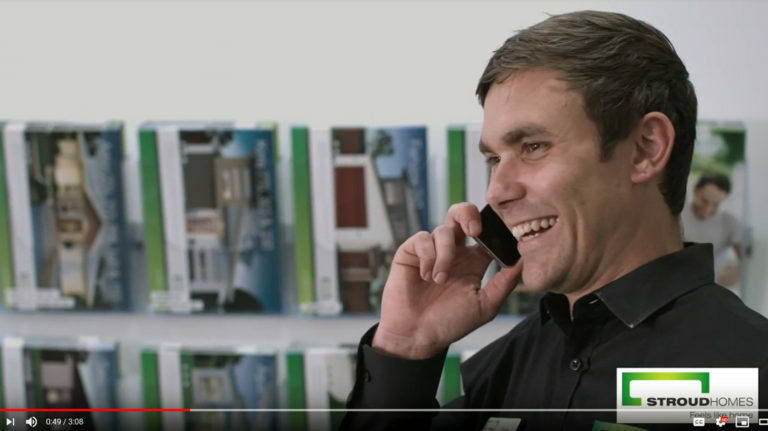 From day one meeting Todd the sales consultant through to our handover with Barry our site supervisor was an exciting, fun and stress free time. All of the trades people we met on site were friendly and professional and more than happy to answer our questions. We were provided regular updates from the site supervisor who would also send through photographs as work was completed. The service and support from the team was second to none, again professional and efficient and happy to answer any of our questions. All the way through our design and build we were kept updated and had no delays. Dream build and the team still maintain contact with us. Stroud Homes Sunshine Coast completed our house in a great time frame. The quality of the finishes and fixtures, that were all standard inclusion mind you, were of a top quality and look amazing. Our building manager was fantastic in that he gave us weekly updates of the work that had been done and the plan for the following week to come. This made everything so clear and we loved having the walk throughs throughout the build. Everyone we dealt with from doing the plans with Todd to signing the contract with Sarah, everyone was professional and made everything easy to understand. My partner and I would like to thank Dan and his staff at Stroud Homes Sunshine Coast For building is this amazing house. This was our first build and what a dream experience it was. Stroud Homes Sunshine Coast were brilliant to work with and really made the whole process stressful free. With the fixed price build it was relaxing to know there were not going to be any surprise. Great communication throughout the build and the finishes throughout were amazing. Shane, our building manager was awesome and really was a pleasure to work with. We are now living happily in our brand new home and it is just perfect. Highly recommend Stroud homes to anyone. 10 out of 10. Thank you Stroud. The Stroud team were brilliant! It was my first build and I had heard so many horror stories and how stressful it can be, with Stroud it was so painless and easy. A positive and professional experience from beginning to end, everything was clear and upfront. Excellent communication and a high quality outcomes. Sarah, Barry and Daniel were flexible, honest and a pleasure to work with. My Stroud house is the best on the street! I will definitely recommend them to anyone wanting to build and hope to partner with them again in the future when I look at building an investment property. Our manager Barry Farquhar was very professional and committed which made the experience stress free. We are very happy with the choice we made and would recommend Stroud Sunshine Coast to anyone who is planning to build a house. Dealing with the friendly sales and consultants was easy, custom modification to a standard plan was easily accommodated. The build process was smooth, the admin team handled all the approvals etc and were always quick with replies. The site supervisor sends weekly updates and pics of the property and responds to quickly. The house would have been completed before the 16 weeks if not for the weather! Build quality is great, very minor defects rectified without fuss. Great work Stroud Sunshine Coast! Unique designs, personable staff, and top value! Stroud Homes Sunshine Coast are a dream to work with! The quality and workmanship of the build are exceptional and the immaculate finishing is second to none. At all stages of the build, we were provided constant updates and felt their communication went well above and beyond. From the start, the team have been fantastic. We are so happy with the build and would highly recommend Stroud Homes Sunshine Coast to anyone. We spent over 12 months looking thru different builders and designs that would suit our small family. Dan and the Stroud Homes team were head and shoulders above all in a number of areas but most of all in who they are as people and what they stand for as a company. Other building companies “extras” were standard for Stroud and any omissions were resolved promptly and with little fuss(as long as done in time). Our block was on a corner so Todd designed a home to fit that gave us everything we wanted and more. The build process couldnt of been done better especially when terrible weather hit at the start but my concerns were put to rest fast by Barry and his communication thru Voxer. We have been in our home for over a year and able to provide a review based on this fact. We seriously couldnt be happier with everything, the follow-up by Dan personally as well as his team has been top notch. We cant recommend Stroud Homes as your builder anymore and know your be happy with the end result. Working with Dan, Barry and the whole team at Stroud has been a delight. Nothing was too hard and very transparent. Tyrone was our sales rep and he also was brilliant. Our build wasn’t a straight forward off the plan design and the team worked very hard to help us build what we wanted, whilst working within our budget, offering suggestions on places to save money to get the best result for our dollar. As with all builds you are going to run into errors and issues, We had a large issue at the beginning of our build that you would expect to put a dampener on the experience. Dan and the team went over and above any expectations to resolve the issue. This is true sign of Dan’s character not only as a businessman but as a person. So much so that its not IF we would build them, its a matter of WHEN. Easy, Simple and Hassle Free!!! Working with Stroud has been an amazing experience! This is our first home, so we were nervous about what to expect, but the Stoud team made the entire process so easy and stress-free. Every step of the way they were involved and so helpful to answer our questions and concerns. We had a beautiful custom build and were amazed at all the Stroud inclusions – stone benchtops, gas, Colourbond roof plus a Colour Consultant to help with the many decisions to make. Communication was amazing – every step of the way we were updated on how the build was tracking and the progress, as well as continual photos along the way. Stroud went above and beyond our expectations! The quality of our build and finishes are amazing and we couldn’t have asked for anything better. Stroud has made our house dreams come true and we couldn’t recommend them more! Amazing first home, first build experience! We couldn’t have asked for a better team to deal with for our very first home. We spoke to a couple of builders prior to Stroud but are so happy with the choice we made to build with them. They were very friendly, professional and their attention to detail was on point. No question seemed stupid. Our house was designed specifically to fit on our block and we couldn’t be happier with the design! The whole administration and construction process was extremely smooth. As soon as our finance approval came through, they were on site and slab down within the week. It all happened in the blink of an eye. Nothing to fault. There were no delays with our build, constant updates (photos anytime Barry was on site) and the Friday summaries were an awesome way to keep you updated with whats happening next. Fantastic contact from Barry always. The finished quality of the build was beyond our expectations. They made the experience really comfortable. Thank you to the Sunshine Coast Stroud Homes Team for making this experience an enjoyable journey for us. We would highly recommend Stroud for anyone looking to build. An amazing build journey with Stroud Homes. As first time home builders living in another state the communication from Stroud throughout our build was fantastic. Overall the team were extremely professional and I feel that our build was well managed from start to finish. We had a few minor issues in some areas with quality and workmanship but in the end what made Stroud Homes great to build with was their quick response to our issues and their willingness to get these rectified for us, including the few snags post handover. Our home was completed on time and within budget, there were no surprise hidden costs at all. We are so pleased with our beautiful home and would like to thank the team Tyrone, Daniel, Sarah, Bec, Ben, Scott, Barry and everyone else at Stroud Homes Sunshine Coast who turned our dream home into a reality. Exceeded all our Expectations !! Due to the steep slope of the block we were going to need an experienced and competent builder and Daniel Chapman from Stroud Homes Maroochydore was our favoured option. We saw one of Daniel’s builds on a similar block and were confident he had the ability to successfully complete our project. Other than requiring a larger machine to drill the foundation holes due to unexpected rock, the whole build was straightforward. The Stroud team were receptive to our personal requirements when we requested design/inclusion changes and assisted with sourcing the most economical options to get the results we were looking for. We felt Stroud’s standard inclusions to be superior to those offered by other builders. The handover date was within the agreed time and within our budget. Based on our recent experience we have no hesitation in recommending Stroud Homes to anyone planning on building their new home. From the moment we walked into the Sunshine Coast Display Home, we were welcomed with open arms. As this is was our First Home, Stroud Homes were the only company that my wife & I felt welcomed at (all other businesses gave the impression of shunning us because we were FHB). It was then & there that we knew we would build with Stroud Homes Sunshine Coast. Every single person we dealt with was fantastic, polite & punctual. They made the design/colour selection Stages run like clockwork & were onsite the day they promised. We had Barry as our Foreman & we could not be happier! Again, he was ever so polite, punctual & descriptive of what was happening. The decision to use the App Voxer is a stroke of genius. Not only did the App allow for Barry to pass on photos of the days work, but it also allowed us to have verbal conversations that were saved, so if any issues did arise, we could trace back through our conversations & confirm. Voxer also allowed Barry to communicate Progress Reports with us. Every Friday we received “This is what happened this week… And this is what is happening next week”. This App also made decision making between clients very efficient. Also, every Tradie we met were just as polite & professional. Whether it was the walk-throughs with the Plumber/Sparky, to the chippies & labourers, all brilliant. The promised Build Time of 16 Weeks is brilliant as you know when the house will be completed. We were lucky to have good weather & no delays & the house was completed in 12 weeks! Now onto the few minor issues. The first I believe was a minor issue that concerned both parties. I believe that Stroud should inform FHB more frequently about the exclusions, in particular, Fence & Turf. This is specified in the contract so it is partially our fault for not remembering this, but it would have been nice to have this relayed more often on the lead up to contract signing. Again, this is only a minor occurrence that is more our fault than Stroud’s, this is more of a suggestion. Now onto the main issue which ultimately made us not give Stroud a 5/5 Rating. The Interior Cleaning. It is way below average. It appeared that all they did was vacuum & mop & nothing more. We are still finding paint splatters on window handles, saw dust/wood filings in window & door tracks, the Goop Floor Protectant on the Garage Floor was not completely removed, Dirty Fingerprint marks over the walls as well as general dust/debris in corners of the rooms where the carpet meets the walls & inside the wardrobes. The exterior wash was delayed by 4 weeks as a miscommunication between Stroud & the Cleaning company they use. They exterior was Dusty/Dirty (some to be expected was still living in a Construction Street) which has led to the Dark Colour Bricks having Efflorescence Stains. It is a work in progress & time will tell if they will disappear. Any issue we had after hand over was resulted very quickly and efficiently. The Hand Over Booklet they present to you is Brilliant as it contains all the information/warranties on the products they used. Every Person we dealt with was amazing & the communication was fantastic. The quality of the build, the finishes & the products was excellent. The inclusions are brilliant – that Oven/Stove is masterful! The use of the App Voxer is a stroke of genius. We were very cautious heading into the project as it was the first time we had ever undertaken something like this. By the time the slab had been poured and we could really start to see the project, any fears I had were quickly squashed and I found it very easy to trust Daniel. We now have an ongoing relationship with Daniel and look forward to the possibility of more builds in the future. From start to finish Daniel never took his finger off the pulse. It was really impressive to see the speed and efficiency he was able to manage the build process with. He managed to do this while always making us feel confident and secure through the use of continual consultations, updates and communication about the progress of the job. The end result speaks for itself and if we ever undertake a project of this size again the choice will be easy. It is with the greatest pleasure that we express our deepest gratitude to your prestigious Building Company and to you personally for doing an outstanding construction job to our Dream home in our canal front home in Birtinya Island. You had left no stones unturned when conducting the building construction job in every aspect of nitty gritty work carried out in completing the project and until the handover. Your company had turned our brand new home beyond our expectation. Right from the planning stage and until the last nail was hammered you had impressed us immensely. You also carried out extra jobs for us which was not included in the contract which helped in drastically reducing the unnecessary headache for us. It is with great pride and joy that we would like to recommend you to any prospective person or family who would be in the hunt for a respectful builder who could carry out the building job with great expertise and experience. I have no hesitation in recommending you to any customer who would like to build their dream home without any fuss or stress.